The outer side of the upper leaf has a wind rose with 32 directions, eight of which are named with the correspondent wind name, compass viewing hole and index arm, and the inscription 'MONSTRO VIAM PERGE SECVRVS [star]' ('I show the way, go on securely'). The inner part of the upper leaf has a pin gnomon dial with Babylonian hours marked in red from 0 to 10 and Italian hours marked in black from 13 to 24. Below it, is a string gnomon dial with hours marked from VI to XII to VI and dots for the half-hour. At the bottom is the signature '[star] HANS TROSCHEL [star]'. The inner part of the lower leaf has a string gnomon dial for common hours marked from 4 to 12 to 8 with lines and dots for the half and quarter hours. There are motifs of stars in the spandrel spaces. 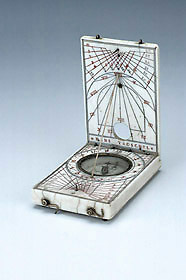 The dial encircles a compass with the abbreviated names of the cardinal points. Below the compass is a pin gnomon dial with Italian hours marked from 10 to 23 in black and Babylonian hours marked in red from 1 to 14. The outer side of the lower leaf has a lunar volvelle with the inscription 'AETATIS LUNAE ET HORAE NOCTIS [star] [star]' and the maker's mark (a bird) repeated three times at the bottom. There are also four bun feet in the spandrel spaces.